Two-and-a-half hours north-west of Madrid, Salamanca is the perfect final stop on the way from Spain to Portugal, or a first stop if traveling the other way round. Cold in winter and pleasantly warm in summer, Salamanca is a clean city, famous for its nightlife and even more famous for its university, and is very popular with foreigners for learning Spanish. The nearest airport is in Valladolid, though Madrid airport isn't too far away. It's best to visit Salamcan In the second week of September, as this is when Salamanca has its major festival - the Virgen de la Vega. September is also the month when the students come back to Salamanca, bringing back the whole purpose of Salamanca. The winter months get very cold, so if you plan on visiting from November to February, bring a jacket! All the main sights can be seen in a day, but it is such a pleasant city that it is worth at least two days. For hotel reservations in Salamanca check out Hotels.com. Approaching the city, the most striking thing is how agricultural the land is. As you enter the city by bus, the landscape is very grassy, with the New Cathedral (it isn't that new, by the way, just comparatively so) appearing over the top of a grassy mound. 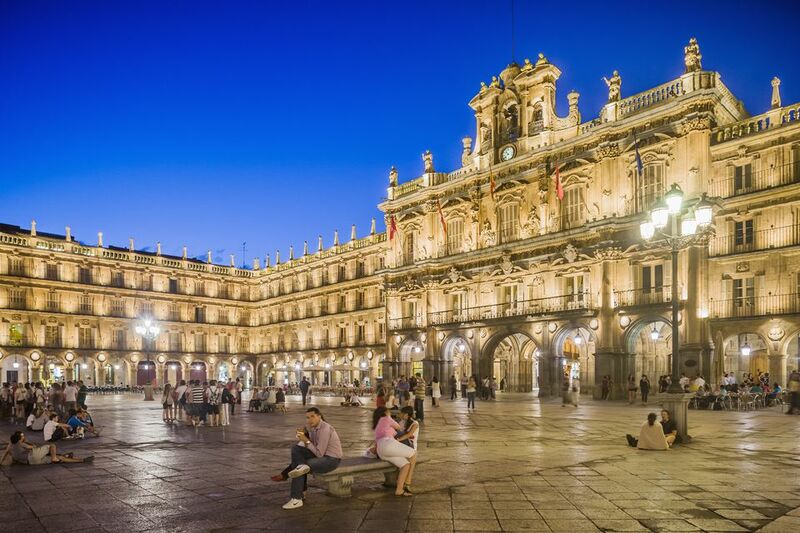 It makes sense to head straight for the Cathedral and start your exploration of the city with a walk up to Plaza Mayor, as these will be your two reference points for your stay in Salamanca. Starting from Plaza Anaya, with the New Cathedral behind you (and its astronaut and ice cream carvings), you have the Universidad Civil to your left (and on the other side of that, Salamanca's famous Lucky Frog). Walking up c/Rua Mayor, you'll have the Clerecia and the Casa de las Conchas (House of Shells) on your left before you eventually reach Plaza Mayor. Within a few streets of Plaza Mayor, you will find a number of beautiful churches and ancient buildings. First, marvel at how everything goes so well together, with the uniform sandstone architecture amazingly beautiful for something so consistent. Then, look for the Lucky Frog on the Universidad Civil before heading around the corner and searching for the astronaut and ice cream cone on the Catedral Nueva. Last, learn Spanish at the University of Salamanca, which is one of the oldest in Europe (the sixth oldest still in existence). The Spanish spoken in this area is one of the purest in the country. Ciudad Rodrigo, a fortress city built high on a rocky rise, on the way to Portugal from Salamanca. Zamora, another walled city, is just an hour from Salamanca by bus. Visit La Alberca at any time in the second half of the year to see the town's pet pig roam the streets. In January it will be raffled off for charity. Read more about Rifa del Marrano de San Anton. Where to go after Salamanca? Head North to Leon and then on to Galicia, south-east to Madrid, or west to Portugal. From Madrid, plan on a 206km trip. It takes 2h30m by bus, train, or car. From Barcelona plan on an 839km trip, which is 11h by bus, 11h15m by train, or 9h by car. From Seville plan on a 462km trip, which is 7h by bus or 5h45m by car.